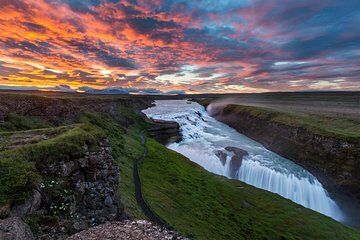 Oplev de mest populære naturattraktioner, som Island er berømt på denne 10-timers Golden Circle tour og aften Northern Lights krydstogt fra Reykjavik. Besøg Friðheimar Greenhouse Cultivation Center med din guide, hvor jordvarme er udnyttet. Se boblende hot pools og dampende gejsere på Geysir, og besøg derefter Geysirstofa Museum. Du kan beundre Gulfoss-vandfaldet og udforske den UNESCO-noterede Thingvellir National Park. Krydstogt fra Reykjavik Gamle Havn om natten på jagt efter de berømte nordlys. Med informativ ombordkommentarer, se skyerne til fortællingsskinnende grønne nuancer. We had a great day on this tour seeing beautiful Iceland! We saw so many beautiful places in Iceland and had an amazing day and learned a great deal about the country and the people - certainly a highlight of our trip. The landscape is otherworldly and we had plenty of time to see the sites and eat at the Glacier stop, which was very expensive. We loved the greenhouse stop and enjoyed expensive Bloody Mary's made with organic tomatoes from the geo thermal green house! The Northern Lights Cruise was cancelled for us 2x due to weather, no fault of the tour company...we were offered a place on the next cruise but alas our time was shorty in Iceland. I'm giving 4 stars because the bus wifi didn't work at all, despite us asking about it, which was troublesome for my party. We had a very bad experience with this tour. We were not picked up for the tour even though we confirmed the address and time of pick up. We tried calling the number provided and the hour of operation was an hour after we were supposed to be picked up. We ended up moving the tour to the next day which sort of change our whole itinerary. A really enjoyable way to spend the day. We enjoyed the glacier walk and black beach tour more, but still a great tour. The actual trip was good and very interesting. However, we were disappointed that we were not collected from the hotel as agreed. The lady did not attempt to find us and left alone. Fortunately the hotel staff organised a pick up from another organisation.